Seasons Retirement Communities, a senior living company operating 11 retirement residences in Ontario and nine retirement residences in Alberta, donates $40,000 to 20 food banks across both provinces this July. Seasons announced its food bank donation at Seasons Royal Oak Village retirement community during its annual family barbecue on Sunday, June 24, 2018, alongside celebrity chef partners Michael and Anna Olson. Each Seasons retirement home in Alberta and Ontario will donate $2,000 to its local food bank. There are currently 9 homes in Alberta meaning $18,000 will go to Alberta food banks. The remaining $22,000 will be donated to food banks near 11 Seasons Retirement Communities in Ontario. 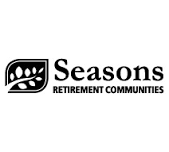 About Seasons Retirement Communities: Established in 2009, Seasons is a Canadian company that operates 11 retirement residences in Ontario, nine retirement residences in Alberta, with more in various stages of development. Our management team has extensive experience in the senior housing sector and has developed a culture dedicated to providing residents with superior customer service. We want our residents to feel proud to call us home and know they are surrounded by people who genuinely care. Seasons: Connect. Care. Change. For additional information on Seasons Retirement Communities, please visit www.seasonsretirement.com or follow us @SeasonsRC on Facebook, Instagram, and Twitter. About Food Banks Alberta: This association of food banks in Alberta has been providing resources and support to its 93 members for more than 2 decades. With a vision of strengthening the food bank community, Food Banks Alberta believes the organization’s core value are to: Lead. Feed. Share.